VANCOUVER - First Nations protesting the construction of the $9-billion Site C dam in northeastern British Columbia are preparing for their own arrests while they implore Prime Minister Justin Trudeau intervene to stop the hydroelectric project. Helen Knott of the Prophet River First Nation said in an interview from the protest site that she and six other demonstrators are camped at Rocky Mountain Fort, the former site of a North West Company fur-trading post established in 1794 on the west side of the Moberly River, near Fort St. John. RCMP said they arrested three protesters on Wednesday who had been blocking an access road needed by BC Hydro crews to begin work in the creation of the dam that will be the third on the Peace River. The dam will create an 83-kilometre-long reservoir and flood the area where the protesters are camping. BC Hydro and Power Authority has issued an eviction notice, warning protesters that all contents of the camp set up on Dec. 31 will be removed and delivered to the RCMP. Knott said the protesters are hunkering down and weathering snow and temperatures as low as -20 C, awaiting the possibility of arrest. "It's not necessarily anybody goes into it with that idea, like 'yeah, we're going to be arrested,' right? It's that, 'yeah, we're committed to saving this tract of land and to, you know, actively use our treaty rights here," she said. Knott said she would rather not be arrested but is willing to be at the camp and take a stand on an issue in which she believes. Several First Nations and local residents have filed legal challenges over the dam, raising concerns about flooding and the impact the lake will create. Art Napoleon of the Saulteau First Nation said in a phone interview from Victoria that the lake will flood the historic site and other sacred areas. "That whole area was a culturally significant area for us, for hunting, trapping, fishing, gathering, a lot of history, all of our history, so that's our cultural institution and it's being raped, and it's still not enough," he said, adding he hopes Trudeau can get involved. "Well, I don't know what exactly he can do but it's worth a shot, isn't it?," said Napoleon. "I believe we're after the possibility of ... governments taking a more-serious look at some of the alternatives that have been presented. They look pretty dam viable to me." He said protesters still think smaller dams, and maybe even under water dams with turbines, are alternatives. 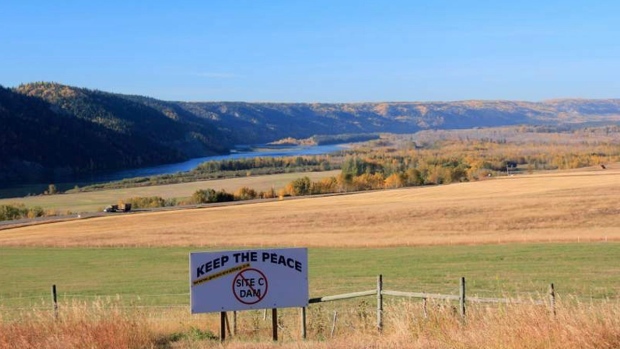 Peace River Valley resident Verena Hofmann said earlier this week that critics of the dam have asked Trudeau to reassess the environmental approval that was grated by the former federal Conservative government. BC Hydro spokesman Craig Fitzsimmons has said the Crown corporation respects the rights of individuals to peacefully protest and express their opinions in a safe and lawful manner. He said Hydro hopes the issue can be resolved and it is in discussions with protesters. The protest camp is in a remote area. Knott said once protesters leave the main highway, they must drive on rough, secondary roads for 90 minutes to two hours, before making another seven-kilometre trip by foot or snowmobile. BC Hydro announced in December it would pay the Peace River Hydro Partners $1.75 billion to build the earthen dam, foundation, two diversion tunnels and spillways. The partners are ACCIONA Infrastructure Canada Inc., Petrowest Corporation and Samsung C&T Canada Ltd.